Insulating films add year-round comfort to your home. They reflect the sun’s heat in summer which helps reduce your home’s overall heat gain. As a result, your home feels cooler, and your air conditioner runs less. Insulating films also retain up to 55% of your home's heat in winter. These films provide comfort you can feel and savings you can see in your utility bills. Insulating films also reduce fade damage to your home's furnishings, floors and window treatments by blocking out up to 99% of UV (ultraviolet) rays. Insulating window films are affordable, energy-efficient improvements for all existing residential windows, including dual-panes, and can pay for themselves in less than a year. They improve the comfort of your home and reduce your utility costs by reducing your top source of heat gain. Glare-reducing or static-cling films help reduce the glare and provide the flexibility of being removable and reusable. These films prevent television and computer screen washout and can improve the look of your home. Glare-reducing / static-cling films also block 99% of UV rays. Glare-reducing films should be applied to the inside of single-pane windows and to the outside of dual-pane windows. Privacy films help create privacy and block 99% of UV rays. Frosted privacy films are translucent and allow light to pass through while providing 24-hour privacy. Mirrored privacy films provide daytime privacy. They allow you to see outside but stop others from seeing in during the day. Black static-cling films also offer daytime privacy and reduce the amount of light that comes into a room. Here are some key terms to help you when shopping and comparing window film. Total Solar Energy Rejection – measures the film’s ability to keep infrared heat, UV rays and visible light from entering the living area. The higher the number, the more comfortable you should be. Light Transmission – measures how light or dark the film is. The lower the number, the darker the film. A film with a 49% light transmission provides an excellent balance of glare reduction and visibility. Visible Light Reflectance – measures the percentage of visible light that's being reflected by the window film. The higher the number, the more shiny the appearance. UV Rejection – measures how much of the ultraviolet A and B rays the film blocks when applied to glass. UV rays contribute to premature fading of draperies, furniture, flooring and other home décor items. Shading Coefficient – measures the net benefits of a window treatment to reduce heat gain. Utility companies often endorse films with a shading coefficient of .50 or lower. 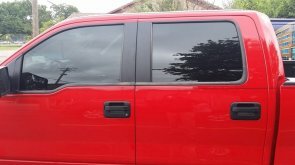 Measure and record the length and width of each piece of glass you plan to tint. You'll need the measurements to determine which kits to purchase. Add 15% to your window film purchase to account for waste and scrap. Apply the film in early morning or late afternoon to avoid the heat of the day. Excessive heat will cause the solution used to coat the glass and film to dry prematurely and could cause streaks in your project. Clean your windows thoroughly with a mixture of 1 teaspoon baby shampoo to 1 gallon bottled water. It's important that you use a solution of no-tears baby shampoo and bottled water to provide the correct pH and final clarity to your project. Never use any cleaner containing vinegar or ammonia to clean the film or windows, as this could damage the film. Cut a piece of film 1 inch wider and 1 inch longer than the window you plan to cover. Spray the window liberally with the same solution you used to clean the windows. Keep your hands moistened with the solution to prevent leaving fingerprints on the film. Use two pieces of transparent tape to remove the backing from the film. After you have exposed an inch or so of the film's adhesive backing, spray the film with the solution. On large pieces, you'll need a helper to keep from contaminating the film when the backing is removed. Starting at the top, place the adhesive side of the film on the glass and work your way down the window. Position the film so it's centered on the glass and spray with the solution. Squeegee any bubbles to within 2 inches of the edge of the window. Keep the surface of the film wet with the solution so the squeegee will pull across it easily. Use a utility knife to trim the film. Leave a 1/16-inch border between the edge of the film and the window. Respray the surface of the film and squeegee out any bubbles. Bubbles will be able to escape through the space between the film and the edge of the window. Once you decided that chemistry is what interests you the most. Well, it was a wonderful decision! Chemistry is an important science, explaining much of what is happening to us and around us. This direction of learning offers great prospects in your future career. But chemistry is also a very difficult science. You probably need any help with your studies. TestBankCampus will help you in mastering chemistry better. They offer a huge number of different tests and manual solutions for those who want to check their results. The tests will also help you to increase your knowledge.